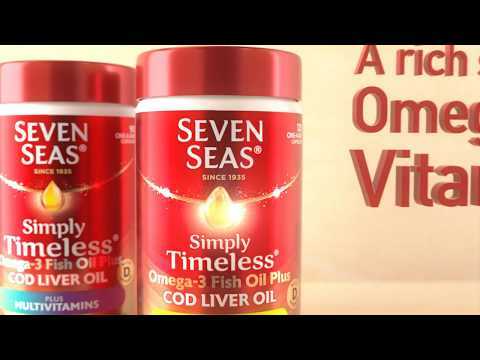 What are Seven Seas High Strength Pure Cod Liver Oil? What is the difference between the high strength and one-a-day Seven Seas capsules? The high strength Seven Seas capsules have a higher amount of omega-3 and vitamin E. The one-a-day capsules have more fish oil concentrate. Who are these omega-3 capsules suitable for? Can children use these capsules? Children aged 12 and over are safe to use these capsules. For children under the age of 12, it is recommended that you consult a professional for advice on what your child can take. Is it safe to use Seven Seas Capsules when pregnant or breastfeeding? If you are pregnant or breastfeeding, then you should speak to a doctor before using these capsules. Can someone who is currently using any medication use these capsules? Anyone who is using medication should speak to their doctor before using these capsules. This is because of the contents of the capsules, which could cause problems depending on what the medication is for. How many Seven Seas High Strength Pure Cod Liver Oil Capsules should be taken a day? You should take only one capsule a day. When taking it, use a cold drink such as water. Any side effect will most likely be caused by an allergic reaction. If you do notice any allergic reaction, then speak to a doctor as soon as possible. Women who are pregnant or planning a pregnancy should consult their doctor before taking vitamin or mineral supplements. Food supplements are intended to supplement the diet and should not be regarded as a substitute for a varied diet and a healthy lifestyle.